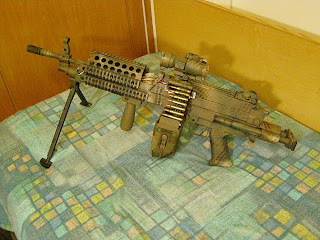 NO, IT’S NOT A MINIMI!!!!!!!!!! 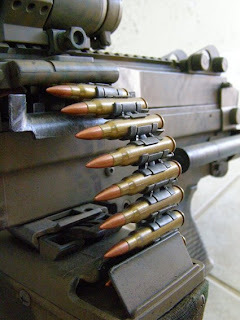 The Minimi (short for French: Mini Mitrailleuse; “Mini machine gun”) is a Belgian 5.56 mm light machine gun developed by the Fabrique Nationale (FN) company in Herstal. First introduced in 1974, it has entered service with the armed forces of several countries (Greece being one of them, even though we are 25 years late as usual…). It is configured in several variants, the standard model, the Para version and the vehicle model. The S.A.W. is just the US Army adoption of the same model built in the States. 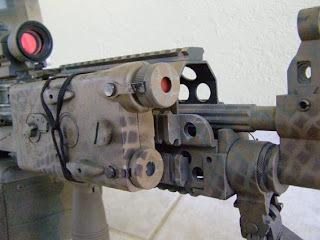 · Incorporating a titanium bipod. Army S.O.COM. 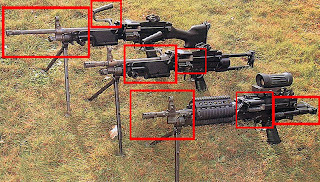 units -> M 249 S.P.W. 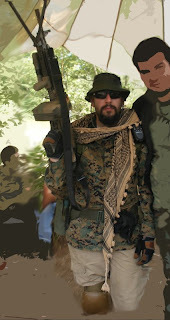 Since I am not into Seals re-enactment we can just call it S.P.W. The finish of the model out of the box is ok, nothing exciting but nothing to complain about. The truth is that the mat black colour seems a little “plastic” though, but that’s because the body is plastic (STAR must do something about it, like to produce a metal aftermarket body…). The “need” to decorate it with a pattern had grown inside me even before I got my hands on the MG. I guess everybody notices that most of the colours are made for Graffiti…Due to the lack of mat model sprays in the market, I decided to use fine-grain mat Graffiti ones. They cost less (2,5 euros per bottle compared to 6 for the Humbrol ones) and the outcome is equally well finished. Initially the AEG was stripped to its main pieces. The body, the front railed handguard, the magazine, the Fakepoint, the PEQ box, the grip and the stock. They were all wiped with a cloth to remove any dirt. Then every piece was sprayed with a couple of Chocolate Brown layers, used as a primer. It was allowed to dry for a day. Next afternoon I applied several stripes of the rest of the colours. Made sure that the pattern is irregular. It was left to dry and the next day the real artistic work began…Just the stripes don’t make the gun invisible, different or interesting…I had to come up with some kind of a pattern. Well, old news…An “S.A.S.” scarf lend me its little squares to do the job…The scarf was placed on the parts and small amounts of different colours were applied. I didn’t want the squares to be normal and regular (otherwise it would resemble the MAR.PAT. which was not the case here) so in some places I stretched it and in others I just “dropped” it on the surface. It took me a total of 2 hours of messing around with it to complete. Judging from the reactions of the players on the field who saw the final work, I can say that I am extremely satisfied with the outcome…Now, that gives me the confidence to try something along the lines on a future project (an SR25K, a Recon Rifle or a Noveske Diplomat maybe?). Αναρτήθηκε από Vaszi bacsi στις 9:24 μ.μ. Τον ακατανομαστο τι τον εχεις φατσα φορα, Καραφλο Αγορι????? 27 Ιουλίου 2009 - 12:03 π.μ. εχεις κανει πολυ καλη δουλεια βασιλη!!!! αλλα η ταινια με τις σφαιρες του πολυβολου ειναι αναποδα. κ παλι μπραβο σου !!! 15 Μαΐου 2013 - 1:06 μ.μ.